Each extension can listen to it's voicemail messages online from it's account or calling the number defined in the admin section in the DIDs section for voicemail. In the Call Forward tab each extension can set the forwarding options.One can forward all calls to voicemail directly or to another number. If another number is selected, then a number has to be inserted below. Other options in this tab include forward on busy(forward calls when extension is busy) or forward on no answer(forward call when extension is called and does not respond in period of time). For the last option one needs to set the NoAnswer timeout field that specifies the amount of time in seconds to call a user before using this option. When setting this interval you should keep in mind that this period also includes the time to connect the call, so that interval does not necessarily equals the ringing time. The default value for this field is 50 seconds. In the address book each extension can define shortcuts for certain phone numbers. The extension associates a phone number to a name, like 789 for monica. When one wants to call monica, instead of calling 789, it will press the digits as if he was writing 'monica' and the system will find the number he wanted to call. In the Call logs tab and in the Home tab the user can see the calls made for and to his extension. The user can select which information to be shown. 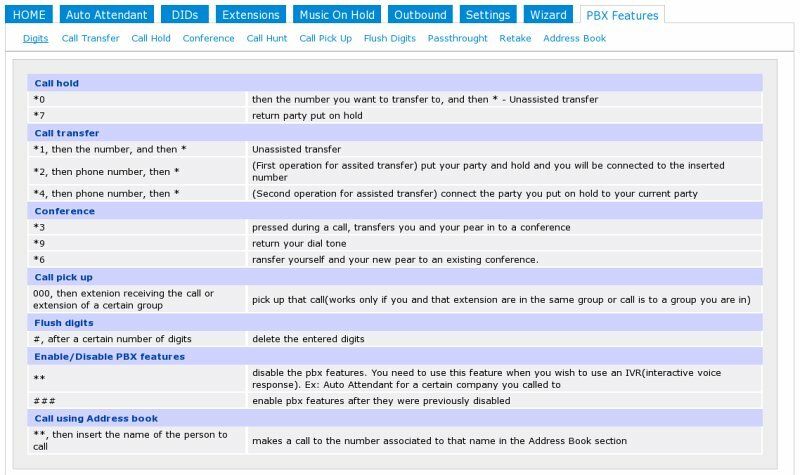 The features below are provided in Yate's pbxassist module. The operations work as described for the default configuration. If some of these operations don't work in the explained way you should contact the administrator of your system to get the correct configurations for these features. In order to make use of this feature easier, there is an option called PBX features in both admin and user account that describes the below operation and a list of digit combinations for each operation. You transfer your party to another number after checking with the other party. This type of transfer is done in two steps: *2, then phone number, then *. This operation will put your party and hold and you will be connected to the inserted number(third party). After third party agrees to receive the call, you press *4. This operation will connect the party you put on hold to the third party. In order to put your party on hold you need to press *0. To return a party on hold you need to press *7. After putting your party on hold, you receive dial tone in order to perform another operation. Just dial the number associated to the conference room. Look in the 'Conferences' tab to see active conferences, their number and current number of participants. During a call press *3 in order to transfer you and your pear to a conference. If you want to add another person to the conference press *9(this will return your dial tone) and you will be able to make a new call. Then press *6 to transfer yourself and your new pear to the existing conference. Press # after a certain number of digits in order to delete the digits you entered. Press ** do disable the pbx features. You need to use this feature when you wish to use an IVR(interactive voice response). Ex: Auto Attendant for a certain company you called to. Press ### after pressing **(to disable pbx features) to enable your pbx features during a call. This feature is enabled by the use of groups. When a call comes for a certain group all the users in that group are called. Call pick up is allowed between members of the same group. If an extension in your group is called you can pickup that call pressing ** and then insert the extension that received the call.